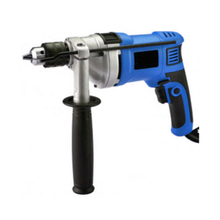 Impact Drill, Impact Drill Products, Impact Drill Manufacturers, Impact Drill Suppliers and Exporters - Dan Yang Three Win Industry Supply Co.,Ltd. - Compact body with powerful motor is developed specially for processing impact drilling functions. - Locking on switch for continuous working. 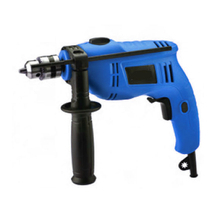 - Applying to concrete, bricks, wood working and metal drilling operations, exchange between drill and impact drill fit for different materials. Impact function offers enough power for bricks and concrete drilling. - Powerful motor results in optimum function with high performance gear. - Ergonomic design with soft grip provides comfortable operation. 1, Compact body with powerful motor is developed specially for processing impact drilling functions. 2, Locking on switch for continuous working. 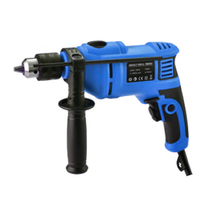 3, Applying to concrete, bricks, wood working and metal drilling operations, exchange between drill and impact drill fit for different materials. Impact function offers enough power for bricks and concrete drilling. 4, Powerful motor results in optimum function with high performance gear. 5, Ergonomic design with soft grip provides comfortable operation. - Powerful motor with strong metal gear box works successfully in applications with very strict requirements, ensuring impact function in maximum performance. - Comfortable to hold and perfectly balance. Side handle with scale of depth can accurately control the drilling depth. - Applying to concrete, bricks, wood working and metal drilling operations. 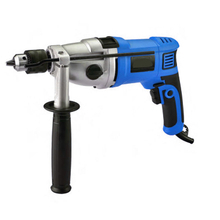 - Exchange between drill and impact drill fit for different materials. Impact function offers enough power for bricks and concrete drilling. 1, Powerful motor with strong metal gear box works successfully in applications with very strict requirements, ensuring impact function in maximum performance. 2, Comfortable to hold and perfectly balance. Side handle with scale of depth can accurately control the drilling depth. 3, Applying to concrete, bricks, wood working and metal drilling operations. 4, Exchange between drill and impact drill fit for different materials. Impact function offers enough power for bricks and concrete drilling. No-load rotary speed: 0-1100RPM. ; 0-3000RPM.